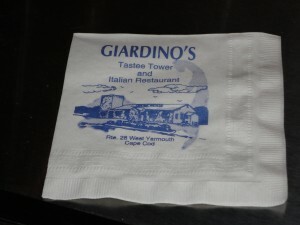 Giardino’s Family Restaurant, originally Tastee Tower with the same pizza recipe that countless vacationers and locals have been enjoying for over over 40 years. From our Fresh Daily Seafood to Pasta dishes, Burgers, Steak..there is something on the menu for everyone. Located in West Yarmouth in the Mid Cape area of Cape Cod. We have a many HD Big Screen T.V’s for watching your favorite sporting events. If you like to play Keno..we have it.